Test it the right way! Each year Motor Magazine selects the Top 20 most innovative new tools in the automotive industry. 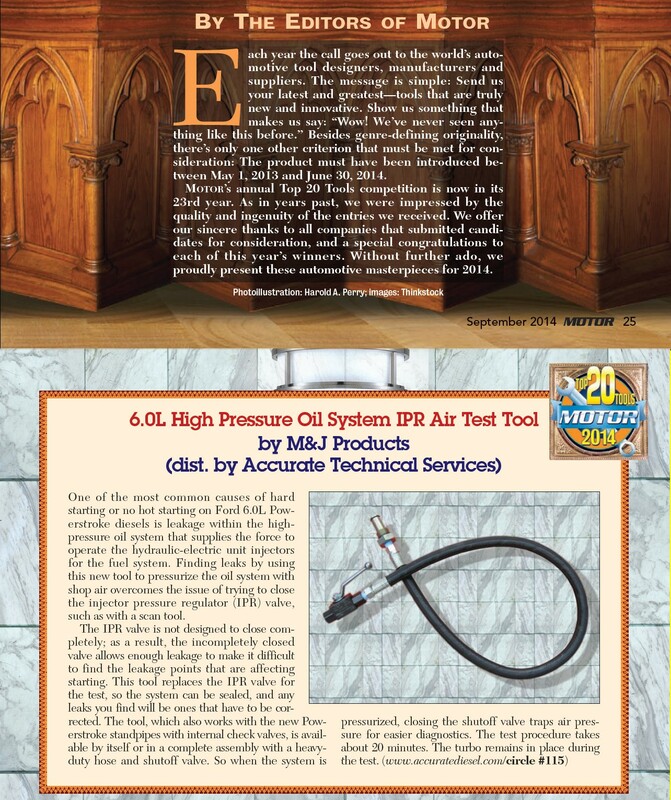 We are pleased to announce that the 6.0L IPR Air Test Tool was selected to receive this highly coveted award for 2014. Click HERE to see a clip of the Motor Magazine article. Due to popular demand we now offer the IPR air test fitting / tool for the following engines also. 1. Remove the IPR valve and pressurize the system with shop air. Listen for air leaks. External high pressure oil leaks would have, of course, been obvious. The primary concern is internal leaks under the valve cover(s). These could include leaking injector orings, or leaking injectors. Listen for any leaks under the valve covers and correct if present. If the center injector oring fails high pressure oil could be leaking back into the fuel system. Remove the fuel filter cap and observe for air bubbles in the fuel. If necessary, individual fuel lines running from the fuel filter assembly to the cylinder heads can be disconnected in order to isolate the problem. 2. (Note that this step is only approved for 7.3L Powerstroke and T444E applications.) If no air leaks are observed, the next step is to isolate whether the problem is with the IPR or the high pressure oil pump. Remove the IDM fuse or unplug the IDM or injector connectors at the valve covers to prevent starting. Install a pipe plug in the IPR air test fitting and crank the engine. (This step effectively deadheads the high pressure oil pump - this is an approved procedure per Ford factory service info.) If the ICP pressure is now above 500 PSI, the problem is a bad IPR valve. If the pressure is under 500 PSI, then the problem lies with the high pressure oil pump. This fitting is made in the USA and and is built to last a lifetime. 1. Complete tool with IPR replacement fitting, heavy duty hose, and shutoff valve assembled (This Listing). Most professional technicians who do a lot of work on the 7.3L Powerstroke should choose this option. The ability to 'air-up' the system and then trap the air pressure by closing the shutoff valve allows even the smallest leaks to be detected. The absence of any unwanted air noises from leaking air lines connected with quick connect couplings makes locating the real problem easier. The hose itself makes an easy 'handle' to thread the fitting into the back of the high pressure oil pump which is in a somewhat difficult location. 2. IPR replacement fitting only (Select Below)- This cost-saving option is intended for lower volume users such as individual truck owners. At less than the cost of one hour of diagnostic time in most areas, this tool can save your hundreds or even thousands of dollars. The complete system can be tested in under 20 minutes - in a professional repair facility this tool will pay for itself after one or two repairs. As with any air tool, you will need to add your own air line quick-connect fitting. Since there are so many various air fitting in use, it is impractical to provide this part. Our tool has 1/4 inch pipe threads to accept standard air fittings. Auto repair activities are hazardous. Always wear protective eye-wear. This tool is intended for usage by trained professionals. By using it you are certifying that you have the necessary skills and training to do so safely. Special offer: Add a 6.0L fitting to your tool and save $10 versus buying separately. Select option below if desired.